I and Ann ate our usual breakfast at McDonald’s and that’s where it all started, I guess. Some bully stole my toy from my Happy Meal™. You can’t trust those 6-year olds. Anyway, I had forgotten that this particular morning was when the Concho Valley Photo Club had their monthly meeting. I had recently told them that I would join. So after getting home, I realized that the skies were a bit cloudy, my favorite conditions for photography. Forgetting about the meeting, I decided to head for my local favorite birding areas. Ann opted to stay home and work on finishing up some glorious looking afghans she is making for gifts. As I was driving into Middle Concho Park, I was greeted by five small dogs of a breed that I was not familiar. At the same time a truck rushed by me, going in the opposite direction. My first instinct was that somebody had just dumped the dogs on the road to get rid of them. Thankfully, as I continued on my way, I passed a campsite where a lady said they were hers. I was tempted to say that she shouldn’t be letting them run loose, for their own safety, but by then the dogs had returned to her. I am not a trouble maker. Weekends are usually busy at the parks, with day visitors and weekend campers. This day was no different. I was approaching a large area where there were about eight campers and motorhomes parked tightly together. Obviously, a family reunion or something of that nature. I was about seventy-five yards away when I spotted an Osprey high atop a dead branch of a tree, overlooking this group. It was feeding on a fish. I backed off about twenty-five yards, turned the car so I could shoot from my drivers side window with my Canon 7D and 500mm lens. I took several images from a distance of about 100 yards. But because of the clamor or the people below, who were completely oblivious of what was going on above them, the bird decided to take his meal elsewhere. My lens was still focused on him so I held the shutter down. Unfortunately, with no time to make a great composition, I clipped his wing. But I feel that the images are still exciting, as you can still appreciate the action. 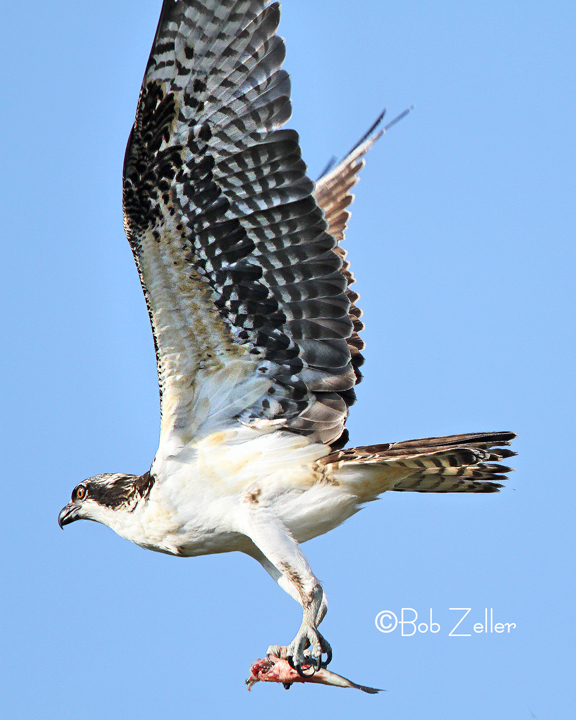 Notice how the Osprey always positions the fish so the head is always pointing forward. I guess they feel they are more streamlined that way. 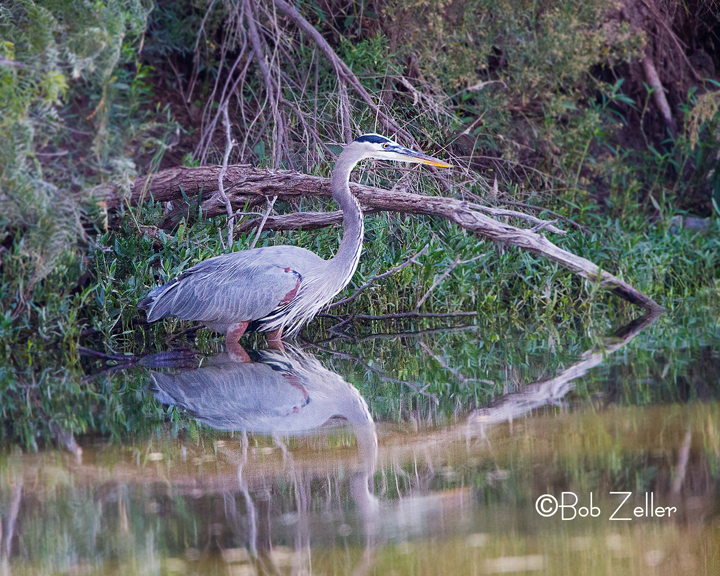 As I continued on my way I saw some beautiful Great Blue Herons on the other side of the river. They are one of my favorite wading birds. This one was just enjoying the beautiful weather. 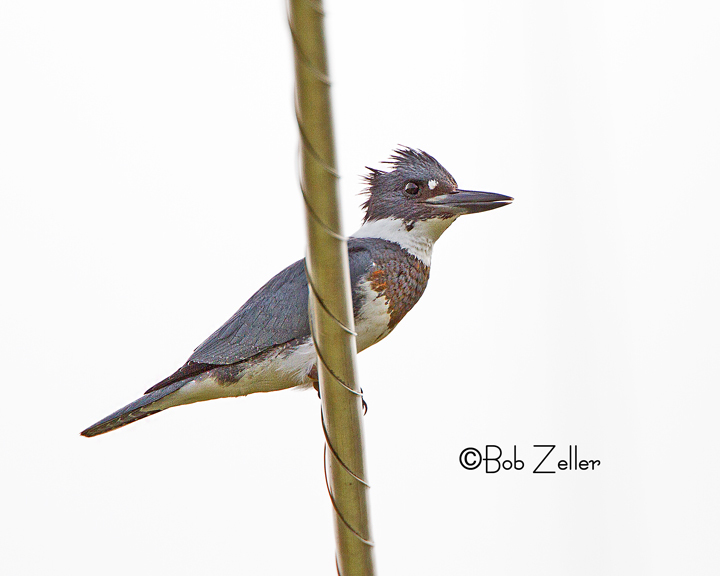 Here is an image of a Belted Kingfisher watching the water from a power line across the river. These guys are amazing. When they spot a small fish, they dive at high speed, crashing into the water at seemingly a hundred miles per hour. It is a wonder that they don’t get a concussion. I decided to call it a day, and when leaving the area, what did I see over a wetland area? 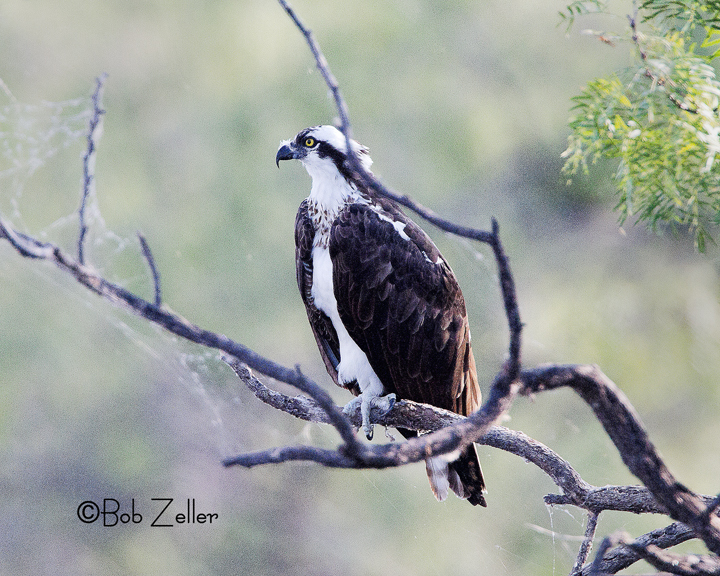 Of course, another Osprey sitting in a dead mesquite. Even though most of our winter birds haven’t arrived yet, it was still a nice way to end an exciting morning. Click on any image to see enlargements. This entry was posted in Birding and Photography and tagged Belted Kingfisher, Bird, birding, birds, blogging, bob zeller, Canon EOS 7D, concho valley photo club, great blue heron, nature, Osprey, photography, texas, texas tweeties, wildlife. Bookmark the permalink. Oh, 6-year olds! They can really screw with your day! Looks like despite the derailment, you got some great pictures! Thanks for sharing! 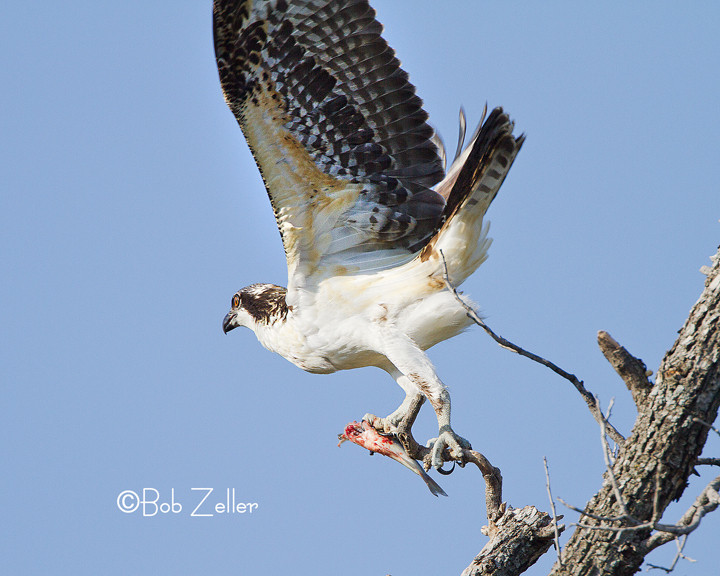 I like how osprey hold their fish-too bad that you lost your happy meal toy.. Thank you so much, Alison. I was actually about 120 yards away with a long lens, otherwise he would have flew off sooner probably. Ok forgiven for forgetting. C.A. did great presentation on hummingbird shooting. Good captures Saturday you got. The Osprey’s are really settled in out there. I see them often but I cant get close up shots like you do. Anyways, next meeting is Nov 9. See you then. Thanks, Tim. There are 2 or 3 that hunt around the area there. Say, I would like to give a presentation for the club. Maybe 30-35 photos and tell the stories how I got them. Do I put them on a CD or a flash drive? 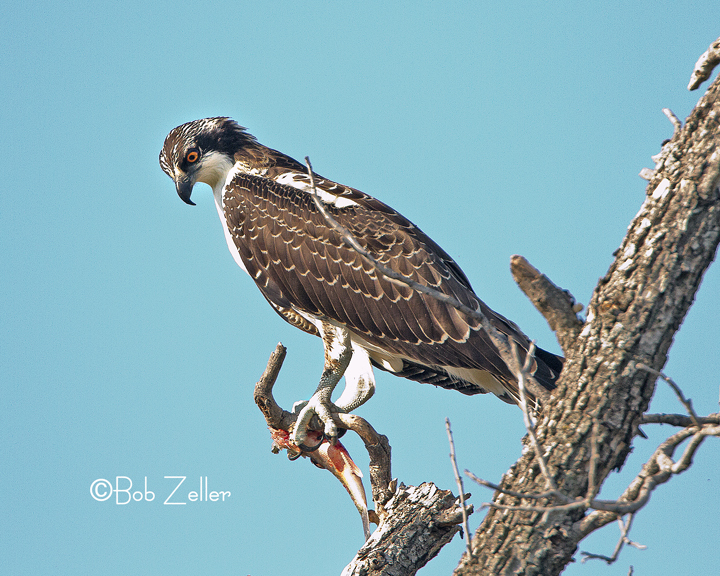 Excellent photos all…the Osprey, Belted Kingfisher, Great Blue Heron. I had a similar experience when I tried to join a local Bird Club… kept forgetting the meeting dates. Your photos give the feeling of seeing them in real time. Thanks. Thanks for all of your kind words, Francisca. I wish there was a good birding club here in San Angelo. Wow. these are beautiful shots! Sorry for the photo club, but boy am I glad you decided to skip. Of course you realize it may be some time before you make that first meeting! Thanks for posting these marvelous birds – spider webs and all! !